Each year, brides and grooms-to-be from all over the nation plan destination weddings that allow their guests to not only celebrate the couple’s love and devotion, but also have some fun in an exciting locale while they’re at it. And, of course, savvy couples know that the Grand Strand — with its range of modern conveniences, fun attractions, and budget-friendly vendors, venues and accommodations — offers a perfect, easy-to-reach coastal setting for both the main event and the bonus leisure time. For couples looking to host their big day on the Grand Strand, one upcoming event offers the perfect place to find great local vendors and venues, plus get some unique wedding ideas, all on one place: The Wedding Showcase. Known as the Grand Strand’s premier wedding show, the event set for Saturday, January 26, 2019, at the Myrtle Beach Convention Center will feature some of the area’s top wedding professionals to help you put together the perfect “wedding team” — including wedding planners, bakers, chefs, DJs, photographers, videographers, venue managers, stationery providers, bridal-fashion retailers, florists, limo services and more. Admission is $12 per person, and interested parties can save $2 per ticket by purchasing ahead online at theweddingshowcase.com. Attendees can meet and speak with vendors in person to discuss their wedding plans, plus get new and unique ideas for making their ceremony, reception and other wedding-related events stand out. Further, attending a bridal show can help brides and grooms-to-be compare the pricing and service offerings of a number of area vendors all at once and all in one convenient location, plus secure on-the-spot bookings and register for fun door prizes. 1. Bring your own pen and pad so that you can take notes and collect the contact information of vendors you may be interested in. Later, take your notes home to review and further research when you have some quiet time. 2. If you have them, bring preprinted, self-adhesive address labels along. This will save you time by allowing you to sign up or register for anything you’d like very quickly. 3. If you’re actually looking to book any services or secure dates with a deposit, bring your checkbook along. Be sure to check on refund policies before providing any money, and read all contracts carefully before signing. 4. For special attention from vendors, wear a “Bride-to-be” or “Groom-to-be” sticker. 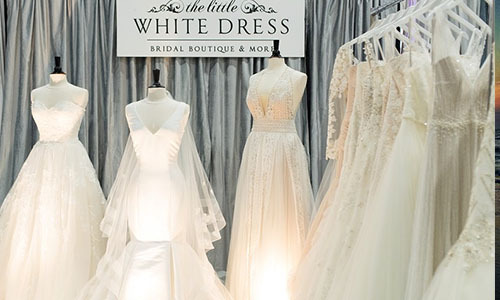 To learn more about the exhibitors on tap at The Wedding Showcase’s January event, visit theweddingshowcase.com. Looking for the perfect place to stage your destination wedding and house all your out-of-town guests? With all the facilities, amenities and expertise needed to make your big day a success, Caribbean Resort & Villas is ready to host you and your all your loved ones for one of life’s biggest events. Contact our event-planning staff today — we’re eager to help make your dream wedding on the Myrtle Beach oceanfront a reality.